​December 2015… The month my life was put on hold. Let me start off with, get your flu shots kids. Yes. Do. It. While we’re not sure if I started with the flu or something else and then it moved into pneumonia, either way it was not fun. For nine days I was quarantined in bed with a fever, for five more days after that I was unable to breath as my lung capacity was severely limited. Trust me, it could have been worse and I’m thankful it wasn’t. So why am I bringing this up in a blog? For two weeks I was unable to do anything, including reading. I never go anywhere without a book (more often hundreds thanks to my nook) with me and I typically have my nose stuck in it. 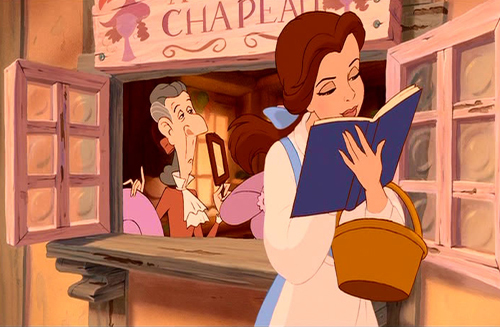 Think Belle from Beauty and the Beast walking through the town reading. For me to be in bed, unable to open my eyes due to fever pains, or too tired to hold the book in front of my face, it was torture. Consequently, I was also unable to write which meant I was unable to publish anything on Channillo the second week of December. This was heartbreaking for me. Because I have readers paying for my content, and donating to Child’s Play, my responsibility and my promise to them, is two days worth of content a week. I failed them that week and it bothers me. This past week I also had to request extensions for book reviews I had committed to due to illness. No one grumbled, everyone was supportive, and wished me well soon. I am so lucky and so thankful for my community. My favorite tweet-hearts checked in on me to see how I was feeling and it really helped me overcome the depression that comes with being ill and so dependent. Now that I’m much closer to “better” I am trying to pick back up my routines. I published on Channillo last week, and I will this week as well. I published a blog last week and this one today. But most importantly, I am reading again. Keep an eye out for Saving Anna by Toni Allen and A Conall Christmas by Bethany Claire as those are both on the docket for this week. ​I wish everyone a safe and healthy holiday season, and PLEASE keep warm and if you do get sick, STAY HOME. Be selfish, keep your germs, and save another person’s holiday season. Thanks for sticking with me, I’m off to cuddle up with a book! Welcome back! Can you believe it’s already December? I can’t! I’ve stocked up on coffee, hot chocolate, teas, and good books to feast on in the coming cold months. I’ve bought the first Holiday gifts, planned my days off, and I’m even throwing a party for all of our “misfit” friends. There’s still so much to do! ​Now that NaNoWriMo has finished many of you may have noticed that I am not shouting from the rooftops my victory… that’s because I did not complete NaNoWriMo this year. I’m heartbroken and disappointed in myself but as you continue reading please remember, what I am sharing with you is not a list of excuses for there are none, had I been more dedicated, I would have succeeded. Instead, I would like to share with you some of my experiences and what I learned this past November about myself and my writing. In past NaNo events I have experienced “writer’s block” and I am a firm believer that no matter if your muses are present or not, you must keep writing. However, this year I had my first encounter with “The Slog”. The dreaded Slog, give me writer's block any day, I think that would have been easier. Writer’s block I can push past, but The Slog is like writing while swimming in jello. For every chapter I finished, I was more confused about the next. Characters had confused voices, didn’t know their own history, and fought with me to get their stories heard. For every word I wrote I struggled to get three more out. I think most of this was my fault and little of theirs. Elrik and Eryn (spoilers!) were fun to write and enjoyable to watch grow daily. The problem rested in my “planning” choices. This was the first time I have attempted plotting versus pantsing and I’m not sure it’s the correct tactic for my style of writing. I am a better version one pantser with version two plotting I think. My creativity is less stifled and words flow from my fingers like water from Niagara Falls. When I plotted I trudged through a choppy ocean with undertown enough to drown even the most seasoned swimmer, of which I am not. ​I struggled and complained and was downright miserable while writing the first 26k words of Redemption and I couldn’t work up the motivation to write the remaining 24k. I made excuses, let myself get sick, went on vacation and destroyed my discipline. All of those choices led me to an incomplete with NaNoWriMo 2015. I’m not proud of it and I’m angry at myself for how this past November worked itself out, but you know what… I’ve learned something very valuable about myself and perhaps next year I will have enough historical knowledge that I’ll be set up for success. Does this mean Elrik and Eryn’s story will never see print? Doubt it. I’m not done with them, I just need to go back to the drawing board for a bit. I need to find that creative spark for them like I did with Onnie and The Bookshop or Annabelle and Lucian’s stories. The spark is there, I know it is. I just need to rekindle it. Maybe I’ll see them in April for Camp? Who knows. ​A romantic film noir style detective story with a modern twist!